Rootstocks. The apple trees are to be on MM106 rootstock the pears will be on Quince A, the plums/gages etc will be on St Julien A and the cherries on Colt. 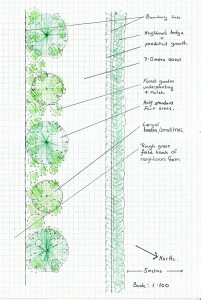 This will produce trees 70 – 80% the size of standards with a height and spread of 3 – 4 metres. The width of the access strip is about 8 metres so this will allow about 3 metres for vehicular access with the whole of the tree being within my boundary. There are deer on the land and trees on these rootstocks can be pruned to have their lowest branches above deer browsing height. This size of tree will not require staking all its life, will fruit after 3 years and live for approximately 50 years. Spacing. 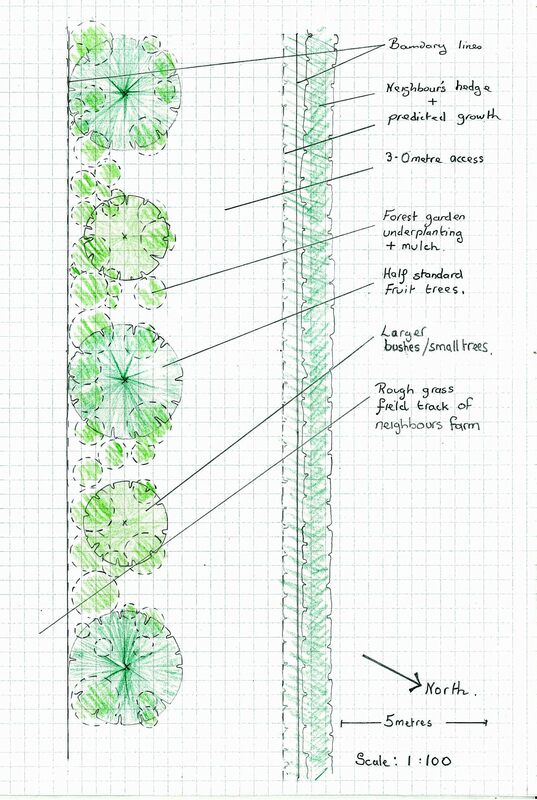 The trees are spaced 10 metres apart so there is plenty of space light and air around and under them for forest garden planting of various berries and perennial vegetables. I could have still had space for this at a closer planting distance but the other reason they are 10.3 metres apart is so more half standard trees can be planted between in 10 – 20 years time. This will allow for a succession of fruit trees to be kept over time. Fruit bushes can fill the empty spaces in the meantime and they naturally become old and unproductive in 10 – 20 years so can make way for the new trees. This may have the downside that trees are a bit far apart for pollinators if the weather is cold and planting semi-dwarf fruit trees in between (protected from the deer) might be another option. There was the temptation to make an avenue with trees on both sides. 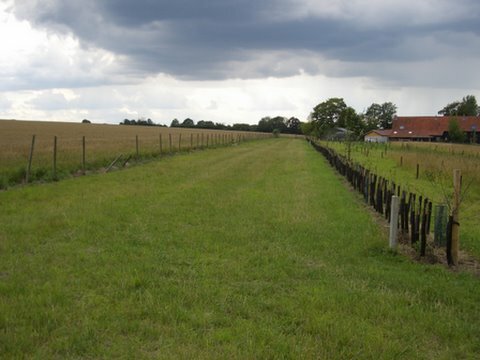 However, this would have meant one row being close to the hedge which has some trees in it and with the close planting of hedging plants the roots would be dense and compete with the trees roots. In addition the other row would have had to be planted closer to the farmers field than I wanted. The spacing from the boundary fence is 1.75 metres. There is a temptation to put trees just inside ones boundary but by having a 1.75 metre distance: the farmer won’t damage the branches with his machinery (which can leave wounds that are liable to infection), the soil close to the tree won’t get compacted by vehicles and I can look after the soil organisms all around the tree particularly the mycorrhizal fungi. (soil organism health → soil health → tree health→ fruit health → our health ). Another reason for wide spacing away from the boundary is so I can plant various productive and pollinator friendly plants under the trees on their southern side. These won’t just be early spring flowers to attract pollinators to the site – pollinators need looking after all year round if you want them to be around to work for you in the Spring. There could be an argument for having fewer flowers out when the trees are actually in blossom as flowers do compete with each other for pollinator attention. Varieties of trees. The fruit trees I have chosen are some that have fruit I am very fond of and also many local heritage varieties (bought form East of England Apple and Orchard Porject who are a charity that sell very reasonably priced trees - www.applesandorchards.org.uk) They have also been chosen to be good pollinators for each other and to avoid incompatability problems. Incompatability problems occur with some cherries, plums/gages etc. and a few apples and pears. These problems arise when varieties are closely related and, like the other issues surrounding pollination, they need to be watched out for when deciding on which varieties to grow. those which are good for pollinating each other are all close together. those that are naturally more vigorous or wide spreading are not directly opposite the neighbour’s trees, which they have planted a few of in their boundary hedge. those which will potentially attract most wasps etc to the fruit fall, the plums and apples, are furthest from the neighbour’s house with the pears and cherries being closest. I am not sure whether the land is in a frost pocket or not and the trees will be exposed to the wind as there is no space for a windbreak to be planted. In general I have chosen trees that flower later rather than early but their flowering is spread over quite a long time. So fingers crossed that some flowers will set fruit .